The images of saints, apostles and martyrs on the Herbert tombs at Abergavenny are not the only rare survivals in the church. The Abergavenny Tree of Jesse is a unique surviving monumental sculpture. 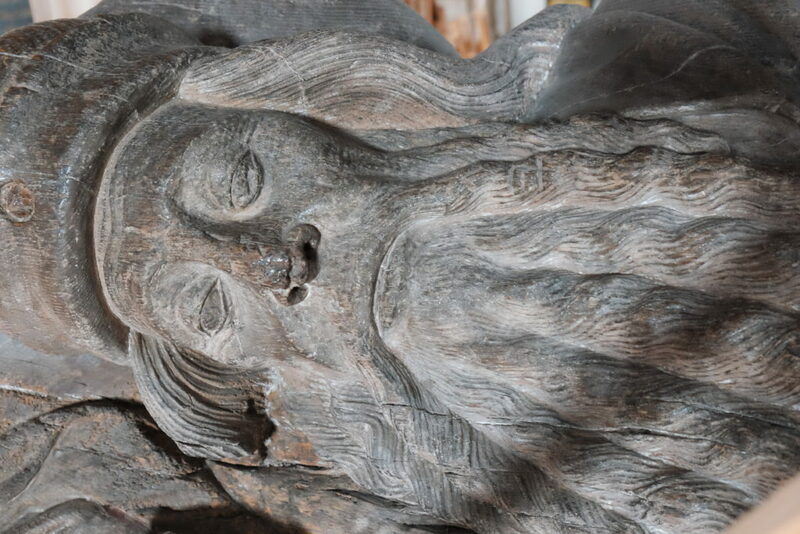 Many, if not the majority, of the devotional images inside and outside British churches in the Middle Ages were carved in wood. Almost all have since been destroyed. So what was the Tree depicting? Jesse was the father of King David, a key figure in the Bible and an ancestor of Christ. 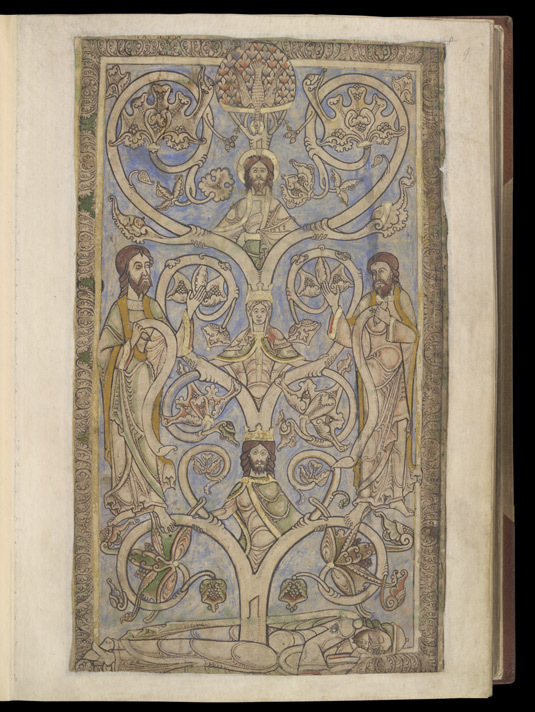 Medieval psalters often included an image of the lineage of Christ to mark psalm 1, ‘Blessed is the man’. It would take the form of a large and leafy tree. Jesse would be shown lying at the bottom, forming the ‘root’ of Christ’s human ancestry. David would be prominently included, often playing or tuning his harp. Visually tracing the lineage of the royal House of David, the image was redolent of ancestral authority- not just the authority of Christ and his teachings, but of the psalms themselves. Found in the Old Testament, the psalms were thought to have been written by King David. They were also believed to prophecy the coming of Christ. Lines such as verse 19 of the ‘Crucifixion’ psalm 21: ‘They parted my garments amongst them; and upon my vesture they cast lots’ were thought to have foretold the events of the Crucifixion, as when the soldiers cast lots for Christ’s clothes. Christ himself also quoted from psalm 21, reciting verse 2, ‘my God, why hast thou forsaken me?’ in his last moments. The c.1150 Winchester Psalter in the British Library (Cotton MS Nero C IV) shows Jesse lying at the foot of the page on f. 9r. The figures of King David, the Virgin and Christ form the tree trunk sprouting up from Jesse’s ‘root’. At the very top of the tree, above the head of Christ, is the dove of the Holy Spirit. The Abergavenny Tree of Jesse dates from centuries later, but we can see the same trunk pushing up from his chest, gracefully curving up from the folds of his robes. 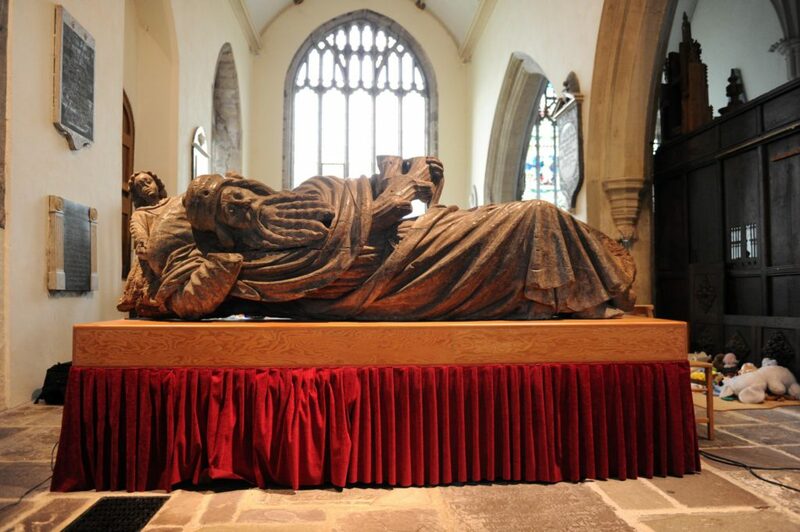 The sheer scale of the figure of Jesse gives some idea of how large the completed sculpture would have been- probably reaching to the roof of the priory church. Originally painted and gilded, it would have been an awe-inspiring sight, emphasising the majesty of Christ and the greatness of his lineage. Courtly aristocrats, with their own love of ancestry, dynasty and lineage, may well have been happy to bow down before it.